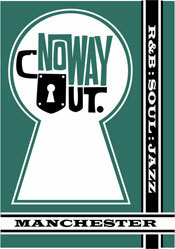 If you happen to be in Manchester over the May Bank Holiday weekend, it’s worth checking out No Way Out. Promising very best in rare R&B, Jazz, and Soul from DJs Smiler, Lee Miller, Stevie Z and resident Phil Saxe, it takes place in the self-contained basement club of the Rampant Lion, just off the Mancunian Way – 10 minutes from the city centre. There’s a free afternoon warm-up, an Ibis hotel five minutes from the venue and Manchester’s famous Curry Mile a stone’s throw away.